(Francisco Kjolseth | The Salt Lake Tribune) Olivia Elliss, a forward with Westminster College women's basketball team battles teammates during a recent practice at the Behnken Field House on Tuesday, Ja. 29, 2019. (Francisco Kjolseth | The Salt Lake Tribune) Westminster College women's basketball coach Shelley Jarrard, center, gathers her team during a practice in the Behnken Field House on Tuesday, Ja. 29, 2019. 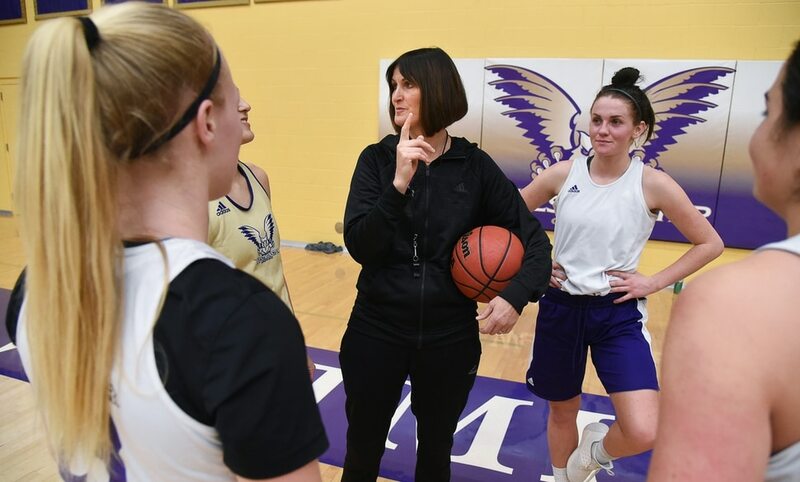 (Francisco Kjolseth | The Salt Lake Tribune) Westminster College women's basketball coach Shelley Jarrard, center, gathers her team before a practice in the Behnken Field House on Tuesday, Ja. 29, 2019. (Francisco Kjolseth | The Salt Lake Tribune) Kaitlin Toluono, a junior guard with Westminster College women's basketball team spots her mark as she runs through drills with teammates during a recent practice. (Francisco Kjolseth | The Salt Lake Tribune) Jessica Perry is lifted by teammates as they remove a training tool from the basket during a practice in the Behnken Field House on Tuesday, Ja. 29, 2019. 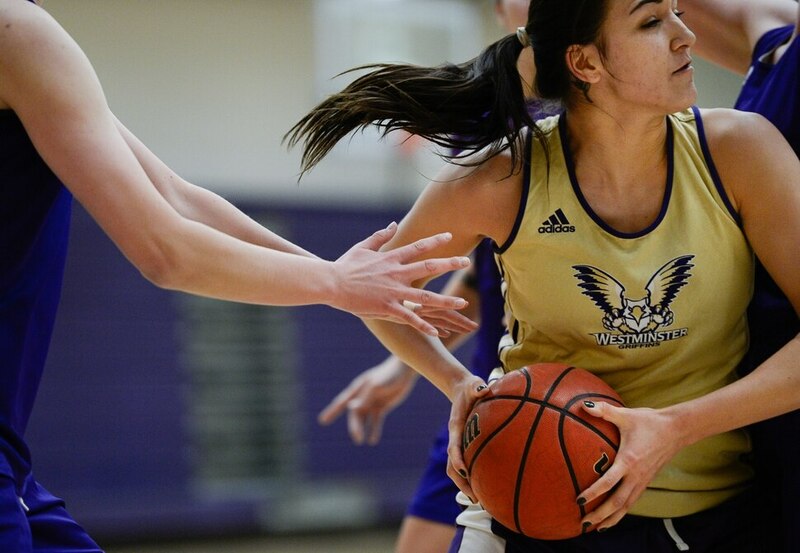 (Francisco Kjolseth | The Salt Lake Tribune) Denise Gonzalez, a senior guard on Westminster's women's basketball team, drives the ball to the basket during practice recently. (Francisco Kjolseth | The Salt Lake Tribune) The Westminster College women's basketball team practices in the Behnken Field House on Tuesday, Ja. 29, 2019. (Francisco Kjolseth | The Salt Lake Tribune) Hailey McCord is pressured by a teammate during a recent practice by the Westminster basketball team at the Behnken Field House on Tuesday, Ja. 29, 2019. (Francisco Kjolseth | The Salt Lake Tribune) Denise Gonzalez, a senior guard on Westminster's women's basketball team, pauses before starting a new drill during practice recently. (Francisco Kjolseth | The Salt Lake Tribune) Westminster College women's basketball coach Shelley Jarrard, center, gathers her team during a practice in the Behnken Field House on Tuesday, Ja. 29, 2019. (Francisco Kjolseth | The Salt Lake Tribune) The Westminster College women's basketball team practices in the Behnken Field House on Tuesday, Ja. 29, 2019. (Francisco Kjolseth | The Salt Lake Tribune) The Westminster College women's basketball team practices in the Behnken Field House on Tuesday, Ja. 29, 2019. (Francisco Kjolseth | The Salt Lake Tribune) Saydi Anderson battles teammates as the Westminster women's basketball team practices in the Behnken Field House on Tuesday, Ja. 29, 2019. At the end of last season, the Westminster College women’s basketball team boasted a record good enough to compete for a Rocky Mountain Athletic Conference tournament championship. But due to the university’s provisional status entering NCAA Division II, it wasn’t eligible to play postseason games. But this year, the moratorium is lifted, and the Griffins are taking full advantage of the opportunity. With just a month left in its conference schedule, Westminster sits at 14-3 overall and 12-1 RMAC, which is firmly second in the standings to only Colorado Mesa (16-1, 13-0). The Griffins have spent the 2018-19 season acting is if they have something to play for because, well, this time they do. “It motivates us more to have a good record so we can go have a good position in the RMAC tournament and going forward to the NCAA tournament,” senior guard Denise Gonzalez said during practice on Tuesday. Westminster finished last season 15-7, which was fifth in the conference. This year the team is on pace to potentially tie for first place and host the RMAC tournament. The Griffins lead the conference in points per game, field goal percentage and 3-point percentage, and are second in scoring margin and 3-point defense. Griffins coach Shelley Jarrard said the difference this season has been the team’s overall depth. Four players — Gonzalez, Olivia Elliss, Hunter Krebs and Kaylee Karsen — average double figures in conference play, while another player, Sicilee Williams, is close with 9.7 points per game. Beyond the numbers, however, it’s the bond the players feel toward each other that has made the biggest difference. Elliss, who is averaging 12.2 points and 6.5 rebounds in conference play, said the team’s friendship off the court puts them ahead of its competition. She added that every player takes responsibility in picking up some slack if someone is having an off day. “If I have to give a little bit more because somebody else is lacking that day, then that’s my job that day and they’ll pick it up for me the next day,” said Elliss, the daughter of former Utah football All-American and Detroit Lions Pro Bowler Luther Elliss. Toluono described the team as a “really goofy” and “sarcastic” bunch. The Griffins flourish, she said, because there’s no off-the-court drama and everyone accepts each other’s differences. After a small hiccup to start the season, the Griffins ran off 13 consecutive wins. The streak ended last week in a road loss to Colorado Mesa, the top team in the conference that now has won 16 straight games. During its 13-game streak, Westminster outscored opponents by 11.5 points per game and shot nearly 40 percent from the 3-point line. The Griffins were just three-tenths of a point from having six players average double figures during that stretch. The team was not surprised in the least that it sustained that amount of success over 13 games. Several players said they were upset the streak ended. Gonzalez, the team’s leading scorer at 14.5 points per game in conference play, thought some pressure lifted off the team after losing to Colorado Mesa. She said she realized after the loss that she wanted to focus on having a little more fun on the court. But Elliss thinks differently. She did not feel the team was relieved in any way after the streak ended. The Griffins haven’t faced much adversity this season. But Jarrard thinks that’s about to change. With the streak ending, Caitlyn Nabity’s season ending four weeks ago due to a knee injury, and Krebs’ status up in the air due to a possible concussion, she said she addressed the team that it may have hard times on the horizon. But Jarrard is confident that her team will respond well, just like it did during the winning streak when any player could have a big night at any time. She trusts her players so much that many of them have the proverbial green light, so long as they’re smart about utilizing it. “If they’re all good shots, they can do whatever they want,” Jarrard said. Westminster looks to start a new streak with four home games in the next two weeks. And no matter who steps up an any given night, the Griffins’ culture, which they have been building over the last couple of years, is sure to shine through.